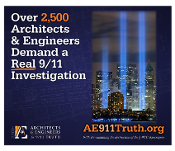 These eye-catching banners will help spread the news that more than 2,500 architects and engineers are demanding a real investigation of the destruction of the 3 WTC skyscrapers. At 62.5" wide and 52" tall, this banner is perfect for sidewalk marches, and will also do well hanging on the wall. Contact us for overseas orders.